Olive Herbal Oil Olive oil is very stable in comparison with many other nut and vegetable oils and is often used to make medicinal herbal oils and salves that need to be stored for long periods. 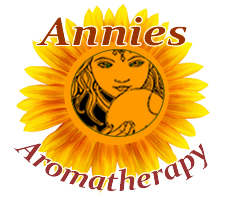 Comfrey, arnica, garlic are along the many medicinal herbs that are infused in olive oil. Olive is more than just a stable base for making herbal oil infusions, it has analgesic and antibacterial properties as well. Olive oil lends itself well to many skin care applications. Healthy culinary herbs add tasty benefits when infused in olive oil. Rosemary, thyme, marjoram and tarragon and many others make delicous culinary oil infusions. 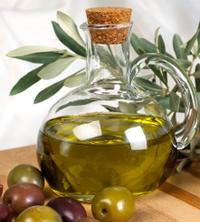 Preparation Methods & Dosage :Virgin Olive oil is used for healthy cooking, and makes a great base for herbal infused oils for the kitchen, and medicine chest. You can infuse olive oil with rosemary, garlic, thyme, and other herbs for a variety of flavors to complement any dish. Olive leaf is used as an extract and the dried leaves can be taken as a tea. Olive oil for heart healthy foods is a monounsaturated oil that is widely used in healthy cooking, and as a salad dressing. Even the extremely conservative FDA allows suppliers of virgin olive oil to carry heart health claims on there consumer packaging. Some care must be taken to not expose virgin olive oil to high heat when cooking, as this can cause heat damage that break down the oil. Some in the health food community caution overheating causes olive oil to have harmful side effects. 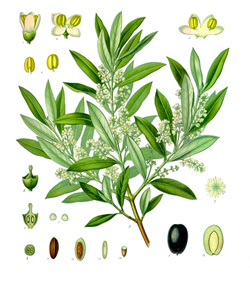 The Olive is an evergreen tree or shrub native to the Mediterranean, Asia and parts of Africa. It is short and squat, and the trunk is typically gnarled and twisted, the silvery green leaves are oblong in shape, and the flowers small and white. Olives are harvested at the green stage or left to ripen to a rich purple color(black olive). Canned black olives may contain chemicals that turn them black artificially. The high position held by the Olive tree in ancient as in modern days may be realized when it is remembered that Moses exempted from military service men who would work at its cultivation.